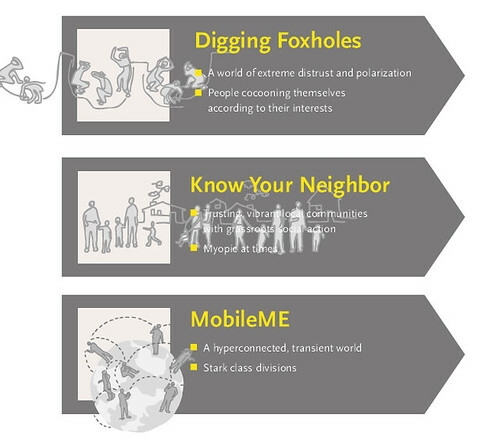 Knight Foundation and Monitor Institute published a new report called “Connected Citizens” that looks at the impact of networks on communities, and asks, what do these emerging networks mean for community change? And, how can funders leverage them for good? The report analyzes many examples of networks and provides tools and tips for Network-Centric Grantmaking. Diana Scearce, who I’ve had the pleasure of working with on the Network of Networked Funders project, is the report author. The report is pure gold. If you are interested in social change and the way that networks help realize change, you must stop what you’re doing and read this report now. Here’s a summary of a few of my favorite parts and framing. 1. Listening to and consulting the crowds: Actively listening to online conversations and openly asking for advice. 2. Designing for serendipity: Creating environments, in person and online, where helpful connections can form. 3. Bridging differences: Deliberately connecting people with different perspectives. 4. Catalyzing mutual support: Helping people directly help each other. 5. Providing handrails for collective action: Giving enough direction for individuals to take effective and coordinated action. This blog post at the Knight Foundation talks about designing for serendipity in more detail. Decentralization and Individual Empowerment: As power is pushed to the edges, individuals will have an increasing ability to exert influence through social and broadcast media. We will be influenced by what our connections think and information production and distribution will become more participatory. Transparency: More information that’s accurate and inaccurate will be available for use and abuse, including more personal information and news. 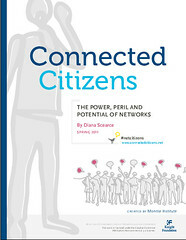 The report asks a number of impact questions related to networked citizens and the future. How much trust or mistrust will there be? What will be the nature of public participation and conversation? What will be the impact of technology on civic engagement? What will be the nature of leadership in a networked world? The report describes three possible scenarios in detail and analyzes the impact for social change an philanthropy. The scenarios describe how communities might be brought together or pulled apart, the ways in which citizens may be well-informed, or misinformed. Embrace a network-centric mindset – experiment with work practices that favor transparency, distributed leadership and working with whole systems. Contribute to learning about what makes networks work and how funders can best participate and support. Don’t hire a person to be the “network leader.” Ultimately, networks are shared responsibility. If this report leaves you itching to discuss the future of networks for social change in communities, the Knight Foundation is hosting a webinar for conversation at 2 p.m. EDT on April 20th (sign up and more info here) . I just downloaded it to read, Beth. I’m particularly interested in the idea of bridging people with diverse perspectives, since I haven’t seen anything yet that suggests that that’s any easier to do with online networks than in person–we need to be thinking about how to build structures that not only facilitate but really encourage that, and it sounds like this may provoke our collective attention. I’m looking forward to spending some time with it. Thanks for sharing! I have to say that for the past few of hours i have been hooked by the amazing articles on this website. Keep up the wonderful work.